The front-thigh consists of the quadriceps muscle group and the sartorius muscle, which lie over and around the thigh-bone (femur). There is also a small muscle called articularis genu, just above the front of the knee. 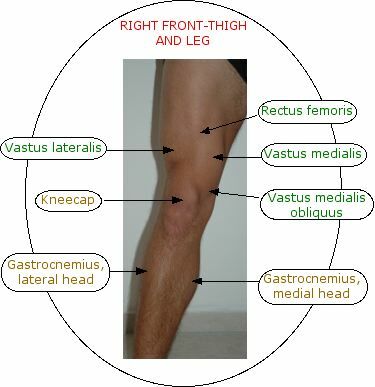 Quadriceps means ”four-headed”, and the four parts which make up this muscle group are vastus lateralis, which lies to the outer side of the thigh, vastus intermedius, the deepest-lying muscle which covers the central area, vastus medialis, which runs down the inner side of the front-thigh, and rectus femoris, the most superficial part, which forms a vertical line from the front of the hip-bone (ilium) to the knee. Incidentally, it’s incorrect to use the term “quadricep” as a singular, as if it meant one of this muscle group; the correct expression is “a quadriceps muscle”, or “one of the quadriceps (muscle) group”. The four quadriceps muscles come together into a tendon at the kneecap (patella) and cover it. The vastus medialis forms horizontal fibres at its lower end, which bind to the inner side of the kneecap, whereas the other parts of the quadriceps form strong attachments over the top and outer side of the bone. The horizontal fibres of the vastus medialis are usually referred to as the vastus medialis obliquus (VMO). 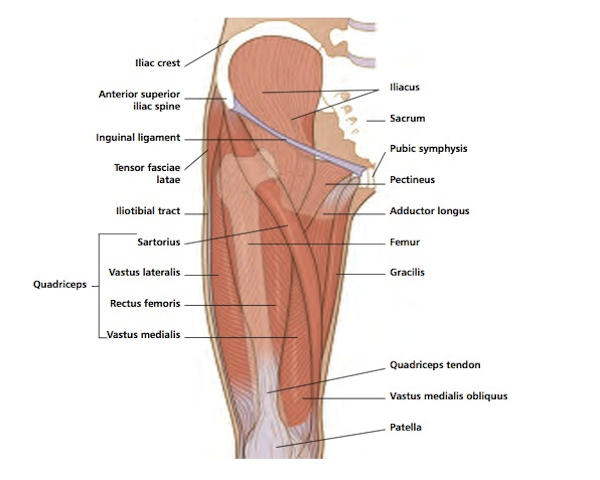 The kneecap is loosely held within the quadriceps tendon, as it is a floating bone, technically called a sesamoid bone. From the lower tip of the knee-cap, the quadriceps tendon forms the patellar tendon (ligamentum patellae), a short tough band which is attached to the tibial tubercle on the front of the top of the shin-bone (tibia). When your leg is straight and relaxed, you can move the kneecap around with your hand. You can feel the cord of the patellar tendon below the tip of the kneecap best when the knee is bent. The sartorius muscle is the longest in the body. Its upper end is attached to the front of the hip-bone (ilium) above the rectus femoris, and passes downwards towards the inner side of the knee. Its lower end is fixed to the top of the front inner edge of the shin-bone (tibia). Articularis genu lies at the lower end of the thigh and is attached to the upper edge of the synovial membrane (fluid-forming lining) of the knee. The quadriceps muscles and articularis genu are supplied by the femoral nerve arising at the levels L2,3,4 in the spine, and the part of the femoral nerve supplying sartorius arises from L2 and 3. Acting concentrically against gravity, the quadriceps muscles shorten to straighten the knee, for instance when you stand up from sitting. When they work eccentrically in the direction of gravity, they pay out and lengthen to control the opposite movement. So when you crouch down, the quadriceps muscles work eccentrically to stop you collapsing under the pressure of gravity. As you straighten up again, the quadriceps muscles work to lift the weight of your body against the downward pressure of gravity. The quadriceps muscles act are of course active when you walk, run, jump or kick. Because they enclose the kneecap, the quadriceps muscles act to draw it upwards whenever the knee is straightened, and pay out to release the kneecap as the knee bends. The horizontal fibres of the vastus medialis play a vital part in this, as they draw the kneecap inwards and lock it in the correct part of its groove on the thigh-bone when the knee is straightened fully. Sartorius acts to bend the hip and knee into flexion against gravity, as well as taking the leg out sideways from the hip and rotating the leg outwards (laterally). These movements are used to the full by classical ballerinas, people who meditate sitting in the lotus position, and sprinters. In normal life, you use these actions walking up stairs and getting on to a car seat. Rectus femoris also acts to flex the hip, bending the thigh on the pelvis. It is active together with sartorius and the hip flexors as you take the thigh forwards in walking, striding or running. As it straightens the knee, unlike sartorius, it acts with the other quadriceps muscles to extend the lower leg. Articularis genu has the particular task of drawing the pouch of synovial membrane above the front of the knee upwards as you straighten your knee. This is a subtle movement which is difficult to see or feel in isolation. The front-thigh muscles co-ordinate with the other thigh muscle groups on each side of the thigh-bone. Their opposing muscle group is the hamstrings, which relax while the front-thigh muscles contract and vice versa. If the front-thigh muscles become weak, the hip may be subjected to greater pressures during walking and running. If the muscles become so weak that you cannot squat down, the lower back takes more of the load when you bend down, and can easily be injured if you try to lift a heavy weight up from the floor using the back muscles instead of the leg muscles. If the front-thigh muscles become tight, either because you over-exercise, or because you sit still for long periods, the two-joint muscles sartorius and rectus femoris tighten most of all. That is why it is important to stretch the front of the hip as well as the knee to keep the front-thigh fully pliable. The front-thigh muscles can be injured through a direct blow, for instance a kick in football or a blow from a hockey stick. They can also be torn or strained through a blocked movement, if you try to straighten your knee against excessive pressure. Overload and overuse can cause injury, not only to the front-thigh muscles, but especially the patellar tendon. High-jumpers are prone to strain the patellar tendon on the take-off leg. Weightlifters and powerlifters can tear the patellar tendon(s) if they try to lift weights that are too heavy. The tendons are more vulnerable to sudden tear if the athlete has been taking bodybuilding drugs, particularly steroids. 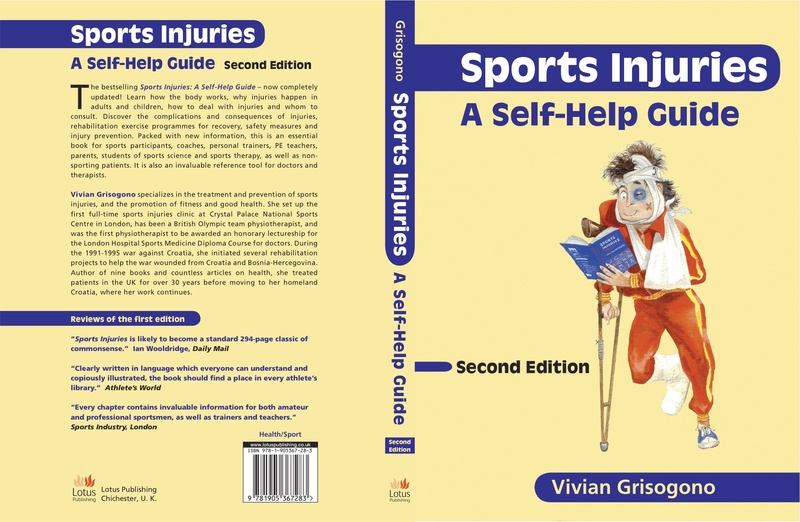 When the quadriceps muscles are injured, especially by a direct hit, large internal bruising can form, causing swelling and turning the skin red or purple. If it’s not treated properly, the bruising can cause bony fragments to form in the muscles, technically called myositis ossificans. For this reason, the front-thigh muscles should never be subjected to deep massage following an injury, certainly not in the early stages. The front-thigh muscles are weakened in any knee injury. The vastus medialis obliquus muscle (VMO) is always the worst affected. The VMO is inhibited almost immediately as the knee is injured, while the rest of the quadriceps muscles become weak during the first few hours. Within about 24 hours, the thigh muscles can lose their bulk, often thinning down by about an inch (2.54cm), so the muscle wasting is obvious and often startling.